Daiwa Millionaire Tournament 7HT baitcaster reel. The Daiwa Millionaire Tournament 7HT was, and still is, used by a small select group of South Island salmon anglers to cast the long distances required for surf fishing. The Daiwa 7HT is designed solely for out and out distance casting. To that end Daiwa has done away with the level wind mechanism, which reduces casting performance, so you have to lay line evenly across the spool with your hand. This isn’t as difficult as it sounds. You just move your thumb, on your hand holding the rod, slowly back and forth as you wind the handle. With a little practice you don’t even think about it. The Daiwa 7HT was designed as a greyhound. It was built for speed and distance. To that end a clicker has no place so Daiwa did away with it! The Daiwa Millionaire was a hot seller in the United Kingdom during the 1990s, where it was used both for surfcasting and dry-land distance casting competitions. It was developed specifically for such events by Daiwa and casting expert Paul Kerry. It became even more popular when a bloke named Neil Mackellow became world champion using a Daiwa 7HT. The 7HT has some interesting features. These include: a titanium main shaft, solid one-piece duralium frame ( three times stronger than standard aluminum), duralium spool, changeable brake collars, and three stainless steel ball bearings. The spool sits very low in the frame so you can get a good grip of the rod during the cast. There are several variants of the 7HT. The original had a gear ratio of 5.2:1 while a later model increased this to 6.1:1. 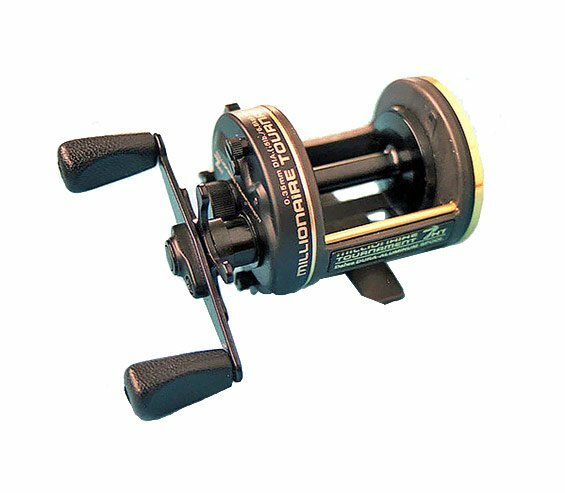 There is also a much later variant the Daiwa Millionaire 7HT Turbo. This modern version features five ball bearings, and a new “floating” spool design. The Daiwa 7HT holds around 340 m of 15 lb monofilament. For surfcasting, and tournament distance casting, a heavier leader of 40 pound or even 60 pound mono is generally used to avoid bust-offs! The centrifugal brake system can be “tuned” for best performance. Some anglers don’t like the small paddle handles that come with the 7HT but these are good for salmon angling where a high-speed retrieve is unnecessary or even a disadvantage. All in all a true classic of design excellence. A reel that would take pride of place in any salmon anglers’ tackle box.